Home » Viznomics: A Quick Glance At Big Issues » Did You Pay Your Taxes? Did You Pay Your Taxes? I read this article and found it very interesting, thought it might be something for you. The article is called Did You Pay Your Taxes? 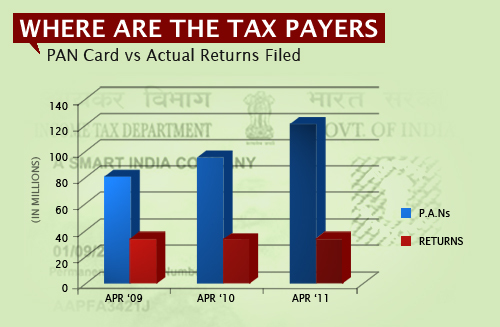 and is located at https://archive.indiaspend.com/viznomics/did-you-pay-your-taxes-2-77571. The number of Permanent Account Numbers (PAN) issued by India’s Income tax Department is now at 121 million. This figure stood at 95 million last year and 80 million in 2009. But the number of people who file returns on their income doesn’t match the number of Permanent Account Numbers issued.